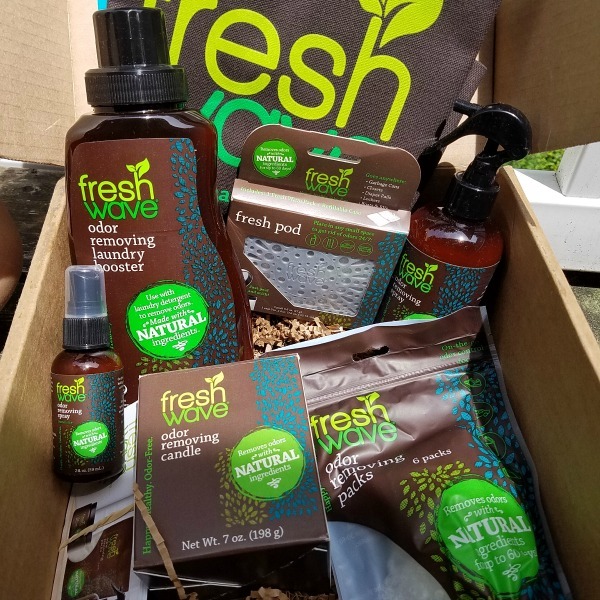 I am very excited to be a Fresh Wave Brand Ambassador. They sent me a box of products to try out. We have used everything so far and love their products. Each item was used in different areas of the home. What I really like about this brand is that they use natural ingredients. No harsh chemicals are needed in the home. We have 2 children and 1 more on the way, there are many odors that I'd like to get rid of. The garbage pail, the bathroom, and the stairway. We live in an apartment complex, so we smell other people's cooking. It is not always pleasant smelling. Dirty diapers in a garbage can is another gross smell we want to avoid. If you have pets these products would be perfect. We placed this Odor removing candle in the bathroom. My husband was using incense in the bathroom and it was bothering my eyes. We started using this candle instead. It works well. I'd much rather use the candle. The smell is gentle on my nose too. 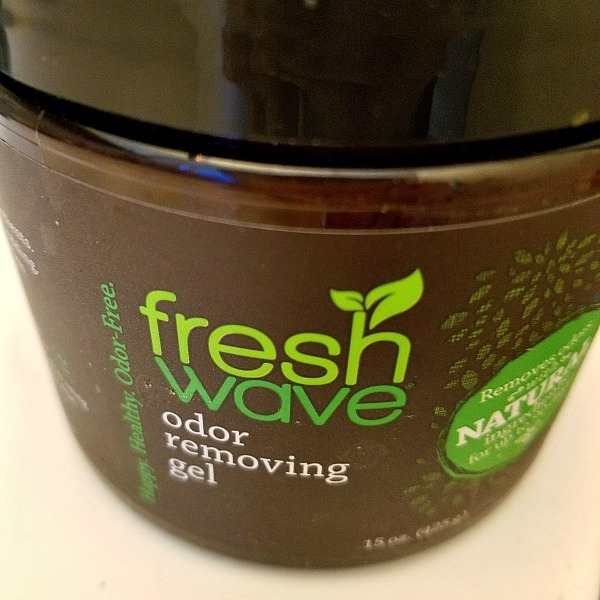 We placed the Fresh Wave Odor Removing Gel in the corner of the bathroom. With 4 people using 1 bathroom, we need all the help we can get. The gel is non-toxic. Open the lid and remove the seal. The gel will disappear after time. 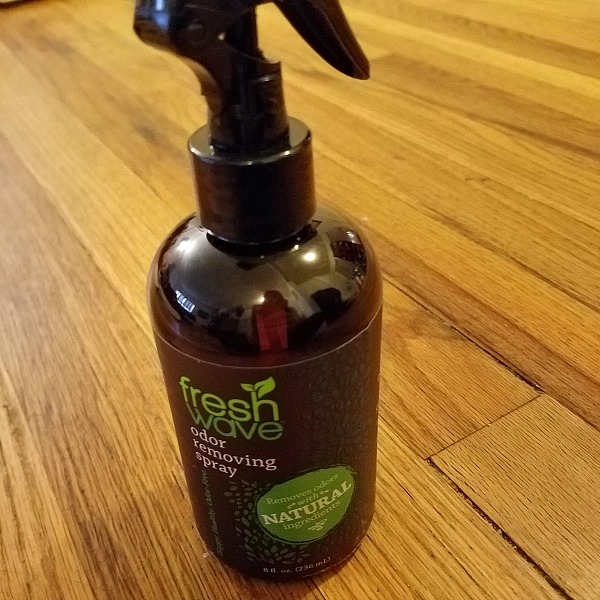 The Fresh Wave odor removing spray is great! We use this as our air freshener spray for almost every room. We spray it down the stair well. We spray it by the garbage pail and in the living room. I feel safe knowing it is made with natural ingredients. I also prefer this smell over any chemical spray. They also have vacuum beads, which we did not try. We do not have any carpet and mostly use a broom on the floors. The odor removing travel spray is perfect for you to throw in your car. When you have kids in the back seat and you allow them to eat food, there will be a surprise smell for you one day. Believe me, it has happened. These products do not mask the smell. The odor molecules actually disappear. Do you have trouble with a particular smell in the home? I suggest you try some of these helpful odor removing products. 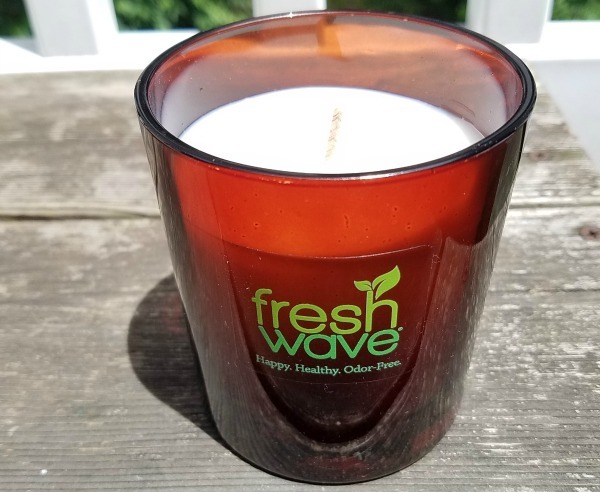 Thank you for sharing this info on Fresh Wave! I hate air freshers and incense are not my thing anymore. Fresh Wave looks like a great solution. I love the concept of these natural products. Sometimes I just can't handle adding more scented ways to fix bad smells. It just over-permeates and completely fails. I love the odor removing gel! I need this right now! We have a boat and there was a problem with the bathroom holding tank and it wasn't pretty if you get my drift. We are not trying to clean up the mess and get things back to normal. I would love to neutralize the odors in as natural was as possible. I've never heard of this brand and will have to look into this. I use essential oils for smells in my bathroom, but this could be a nice alternative. We try to use green products as much as possible and these look great. Would love to use these in my laundry room or basement. Going to check them out! I'd love to try these. I especially like that they actually get rid of the odor rather than simply mask it. With four cats, this in definitely something I'd like to try. We don't usually have a problem but if we go out for a while this would be a great product!